Your screen isn’t the only element on the iPad that can be damaged, so consider getting a case for it so you can carry it around the house or around town safely. Besides providing a bit of padding if you drop the device, a case makes the iPad less slippery in your hands, offering a better grip when working with it. 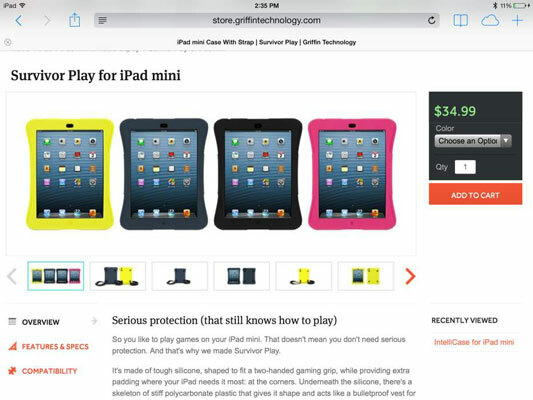 Several types of cases are available for iPad and iPad mini, and more are showing up all the time. You can choose the Smart Cover from Apple that covers the screen, for example ($39); the Smart Case from Apple, which wraps around the iPad completely ($49); or covers from other manufacturers. Others have found the covers from other manufacturers to be somewhat sturdier than Apple cases. For instance, Tuff-Luv and Griffin Technology come in materials ranging from leather (see the figures) to silicone. 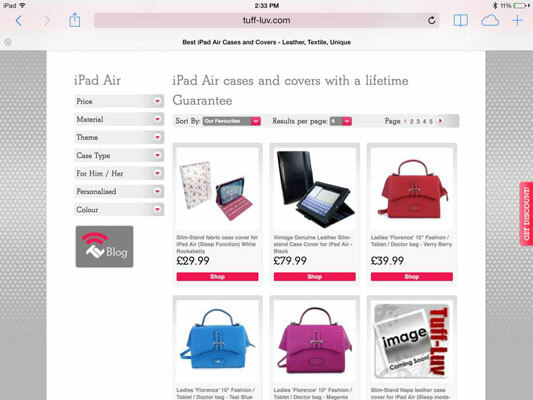 Casemaker Tuff-Luv’s website, where you can find a variety of iPad cases. A less-expensive option is a silicone skin. Cases range in price from a few dollars to $70 or more for leather; some will cost you hundreds of dollars. Some provide a cover, and others protect only the back and sides or, in the case of Smart Cover, only the screen. If you carry around your iPad much at all, consider a case with a screen cover to provide better protection for the screen or use a screen overlay, such as the invisibleSHIELD from ZAGG.